Explore Map of Virginia, officially the Commonwealth of Virginia, located in the Mid Atlantic and Southern regions of the America. It is nicknamed the "Old Dominion" and "Mother of Presidents" because 8 USA presidents were born there. Home to the first permanent English settlement in the American continent, Virginia throws a lot of surprises to travellers. 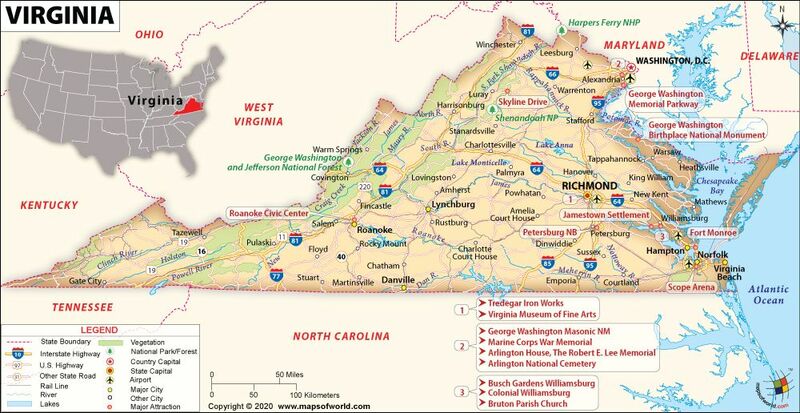 Explore Virginia with this detailed map. 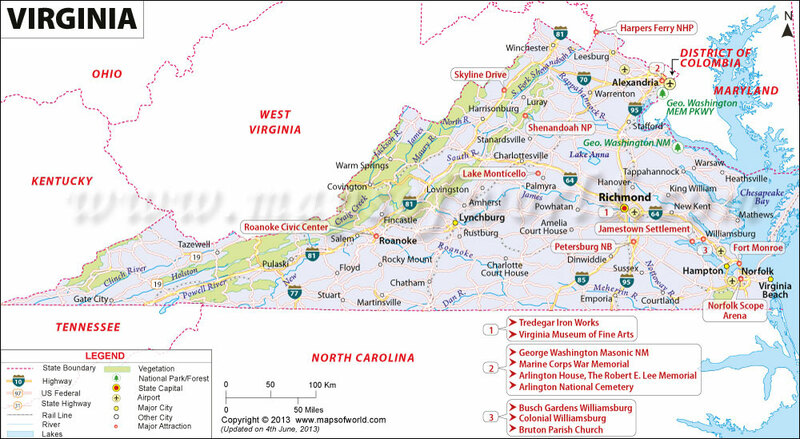 About Virginia Map - The 35the largest state is bordered by the Atlantic Ocean to the east, Kentucky to the west, Maryland and Washington, D.C. to the north and east. In the South, it shares it borders with North Carolina and Tennessee, while West Virginia lies to its north and west. Apart from the heavily forested region on the west, the map shows the location of airports near Richmond, Alexandria and Norfolk. Richmond, the state capital located in eastern Virginia, is known for the famous Virginia Museum of Fine Arts. Virginia Beach, the largest city, is located on the southern tip. Alexandria, in northeast Virginia, is home to quite a few memorials and the Arlington National Cemetery. The official map of Virginia consists of the seal of Virginia on a blue background. It was adopted in year 1861. Nicknamed the 'Old Dominion' and the 'Mother of Presidents', Virginia is situated in the Mid-Atlantic and the South Atlantic regions of the US. Of the 50 US states, Virginia is the 35th largest in terms of area and the 12th most populous state. As of 2015, Virginia had a population of 8,382,993 people. Richmond is the capital of Virginia, while its largest city is Virginia Beach. Virginia comprises 95 counties and 38 independent cities. The history of Virginia dates back to many centuries. Before the Europeans made Virginia their home, the region was inhabited by native American tribes. In the 16th century, many European expeditions to the state were organized. Virginia was the first region of the Americas where the English permanently settled. In 1607, the English founded Jamestown on the banks of the James River. Virginia had a prominent role in the American Revolution that was fought between 1775 and 1783. During the war, Richmond became the capital of Virginia. Virginia was also in the spotlight during the American Civil War fought between the years 1861 and 1865. On April 17, 1861, the state voted to secede from the US. During the Civil War, Virginia sided with the Confederate states and around the same time, Richmond was elevated as the capital of the Confederacy. Virginia was also in the news during the September 11 attacks. Around 190 people were killed when a hijacked jet passenger plane crashed into Pentagon in Virginia. Virginia covers an area of 42,774.2 square miles. To the north and east of Virginia are located Maryland and Washington D.C. North Carolina and Tennessee are located to the south of Virginia, while Kentucky is located to the west. West Virginia is located to the north and west and the Atlantic Ocean to the east. Around 65 percent of the state is covered with forests. Some of the mammals that can be found in Virginia include white-tailed deer, beaver, bobcat, coyote, black bear, raccoon, skunk, among others. The state is also famous for Walleye, brook trout, Roanoke bass, and blue catfish. Virginia has an abundance of national parks which boast of immense greenery and exotic flora and fauna. Mount Rogers, standing at a height of 5,729, is the highest point in the state. Some popular tourist attractions in Virginia are: Shenandoah National Park and Skyline Drive, which apart from a splendid view also offers numerous hiking trails. Here you would come across the Luray Caverns which are famous for its amazing stalactites and stalagmites formations. The Arlington National Cemetery contains the graves of many prominent US personalities. The most famous of these are President John F Kennedy's grave and the Tomb of the Unknown Soldier. Busch Gardens is a lively park that has Europe as its theme. Other places worth visiting in Virginia include Manassas National Battlefield, Chincoteague and Assateague Islands, Jamestown and Yorktown, Virginia Beach, among others. There are five main airports in Virginia and these include Washington Dulles International, Reagan Washington National, Richmond International, Newport News/Williamsburg International Airport and Norfolk International. The state is also well-connected by rail with Amtrak passenger rail service running along many corridors. From Fredericksburg and Manassas, Virginia Railway Express operates two commuter lines into Washington, D.C. In Virginia, the counties and cities generally operate the public K–12 schools. In Virginia, there are the general public schools, Governor Schools and magnet schools. There are approximately 176 colleges and universities in the state with some prominent ones such as the University of Virginia, The College of William & Mary, and Virginia Tech. The largest university in the state is George Mason University. Eight presidents of the United States were born in Virginia. These include George Washington, the first President of the country; Thomas Jefferson, James Madison, James Monroe, William Harrison, John Tyler, Zachary Taylor, and Woodrow Wilson. Virginia is also known as the Internet capital of the world.